Robert Keightley (24), of Rossiter Close, Melton, pleaded guilty to assaulting a man in Melton, thereby occasioning him actual bodily harm, on March 7. He was committed to Leicester Crown Court for sentence on April 20 and granted conditional bail. Keightley also pleaded guilty to stealing a bottle of vodka from the Nottingham Road Tesco Express store on December 19. He was discharged conditionally for 12 months, ordered to pay £18 compensation, a £15 victim surcharge and £85 costs. Jabe Parker (21), of Sherwood Drive, Melton, pleaded guilty to using threatening, abusive or insulting words or behaviour towards a man in Melton on February 6. Parker was made subject of a community order, including a 10-week electronically-monitored curfew requirement, and ordered to pay a £60 victim surcharge. Andrew Faulkner (31), of Clark Drive, Melton, pleaded guilty to stealing £45 of perfume from the town’s Boots store on October 20, a £28 jacket from Melton’s Peacocks store on November 13, £60 of plug-in refills from the town’s Wilko store on November 21 and washing powder from the same store on November 23. Faulkner was made subject of a one year community order, ordered to pay £143 compensation and a £60 victim surcharge. 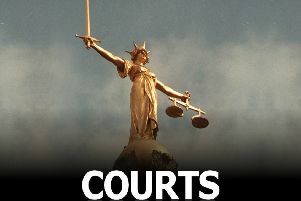 John Hill (54), of The Green, Stonesby, pleaded guilty to assaulting a man in Melton on July 30. He was fined £600, ordered to pay £100 compensation, a £60 victim surcharge and £250 costs. Nigel Wakefield (54), of Eaton, was found guilty of assaulting a woman in Scalford on January 3. Wakefield was fined £200, ordered to pay a £20 victim surcharge and £300 costs. Jessica Harley (24), of Dieppe Way, Melton, was found guilty of using threatening, abusive or insulting words or behaviour towards a woman in Quorn on July 11. Harley was fined £165, ordered to pay a £20 victim surcharge and £300 costs. Colin Shelton (37), of King Street, Melton, pleaded guilty to smashing a window in King Street on October 25. Shelton was discharged conditionally for 12 months, was ordered to pay £125 compensation, a £15 victim surcharge and £50 costs.